I'm trying to recover from a semi-grueling session at the Spot, where I was trying problems that don't suit me at all, namely big moves between pinches. Keeping the momentum for these kinds of problems is a big issue for as well as coordinating throws. The hardest moves on problems these days typically fit that profile and I want to become more proficient at them. I'm hoping the semester break will aid in this endeavor. European wunderkind David Lama has been in town, forced to climb indoors, where he demolished the testpiece Black A-Team route at CATS, onsight. This problem is at least a 13d/14a route and shows the locals what the new international standard is all about. I've been avoiding CATS recently since there is rarely room either to climb or bring our daughter. The Spot is much more favorable in that regard. Maybe once the walls get reset, things will change. The Emerson-Capps New England Polar Bouldering Expedition was forced to retreat in the face of mammoth snowfall and phalangular injuries. Rumor has it that members of the party were forced to eat the sled dogs just to survive. Hope you heal soon Brian. Amazing to think that Jamie's climbing more in New England than we here in Colorado are. That what the Spot and CATS are for. (Can't do the BRC with infants). Nick Sherman has set the perfect project at the Spot--the fourth and final rehab problem (pink on the River Wall). Crimpy, reachy, powerful V11, maybe soft 12 but classic. I hope I can get it before the next setting cycle. The moves are falling one by one but the continuity is fierce. Also had a decent campus session on Sunday. I'm wondering if there's a chance I can tick V13 by next fall? I'm setting that as a goal. Sophia turned one year old yesterday and we had a little party and bought a Christmas tree. Amazing how quickly that year has gone. In case you thought bouldering was anything like extreme, visit the New York Times for this article about skydiving with a wing suit. Talk about landing technology! Just for Olson so he doesn't get disappointed in my lack of posts. Speculation about the grade holding up surfaced the other night but I am waiting to see repeats. The video, again at Moon Climbing, shows a dynamic climb, a miniature route really, and clearly a Colorado classic regardless of the grade, up there with No More Greener Grass. While there are some big holds, the angle is extreme and they are far apart Given the patch of ice at the lip, Ty may have also done the hardest mixed climb in Colorado. Except for the knee dab at the lip, amazing form. Skeptics or not, this is a significant ascent and Ty has expressed his reservations about the grade as well. Climb it for the line which is amazing, especially for a problem 5 minutes from the road--makes it easier to shuttle the many pads required. On the less significant side, a link-up of UCT and Trice has been done which while clearly difficult is not exactly inspiring since there isn't much hard climbing to get there. A fairly short Epoch so to speak. Unless it was the Reverse Undercling Traverse. I'll stick with the sit start as the way to go if anyone wants to squeeze more climbing blood from this mostly dry turnip. Also there's the Hagan's Wall start. Anyway snow's coming down so it all may be academic for a while. It will be for me as I correct papers and get a grad school application in order. By the way impressive dispatches from Jamie and Brian in New England, the land of real winter. Tearing through Pawtuckaway, Rumney and Lincoln Woods in weather better suited for ice climbing--SICK! I was psyched to dispatch the third rehab problem, a crimpy little V9 (maybe soft 10) at the Spot, a leftover from the comp (left side of the Hueco Boulder, purple tape, for you Spot crawlers). It went pretty quickly so I'm psyched. Since I have no time for outside climbing right now, it will have to do. A very impressive FA was done last week by Tyler Landman, Midnight Express, likely V14. Located on an outcropping/boulder just uphill/southeast of Castle Rock in Boulder Canyon, it's tall and very difficult. Go to Moonclimbing for more about this climb. Landman's account is remarkable for its detail and insight, especially for a 17-year old climber. Presumably videos will be popping up all over and I will link to them as they become available. The problem is especially remarkable for its being right off the road and hardly tried. 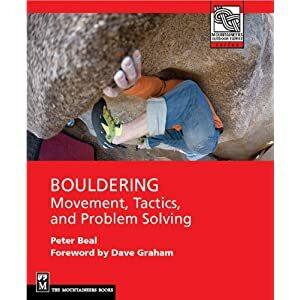 This will prove to be a major testpiece for Colorado boulderers as it follows a beautiful line, is easy to get to, and will, I predict, easily hold its grade. The boldness will only add to the aura. Landman has been crushing major testpieces left and right very quickly all around the US, the UK and Europe. Now there is a V11, a V12/13, and a V14, almost all literally a stone's throw from Castle Rock. The Frontrange Bouldering Index is reaching new heights. If Paul can finish his PB boulder project before he leaves town next, we are definitely seeing something getting started. Will the roof project at Cob be next?